ABOVE RKE1 Winter Tree Triptych (Sycamore. Lacquered finish)) 23cm diam. LEFT RKE4 Summer Warden Tree (Walnut. Lacquered finish) 15cm diam. RIGHT RKE3 A River Ran (Ash. Lacquered finish) 12cm diam. LEFT RKE 2 Shawondasee (Lime paint finish with cut back texture) 24cm diam. Richard is self taught and has been creating wood art for several years. He is a member of the Association of Woodturners of Great Britain and the American Association of Woodturners. Richard was recently accepted onto the Register of Professional Turners. He writes articles for “Woodturning” magazine. He is passionate about raising the profile of woodturning to a wider audience. 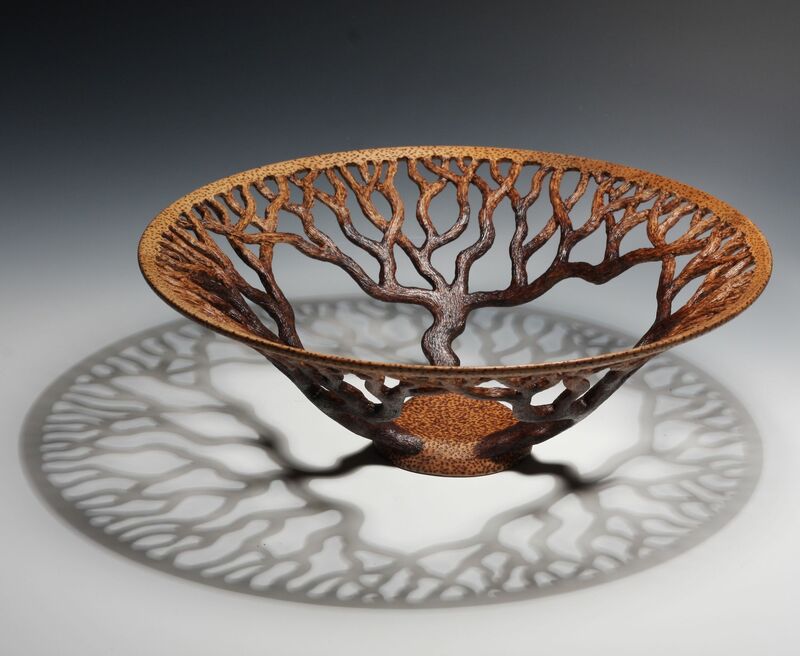 Recent developments in technology and practice have seen woodturning emerge as a vibrant addition to the gallery scene. Richard’s work has moved away from the more traditional functional items commonly seen in craft fairs and gift shops and he now creates ornamental pieces. Using mainly British hardwood sourced from environmentally sound suppliers, windblown and even driftwood when available, he focuses on simple shapes often with very intricate detail, creating clean, modern, tactile work. Working with wood is a privilege and something he finds hugely satisfying. When creating a piece he finds that a compromise needs to be struck between the artist and the raw material. Working with nature rather than against it, he feels that flowing line, form, and proportion are paramount to his design. Richard has sold pieces all over the world but has settled in Argyll to work influenced by its dramatic scenery and raw beauty. He is inspired by the world around him, from the shape of the shoreline, a weathered rock to architecture or ancient ceramics; everything has a line or texture that has potential. He is currently exploring applied texture and the closed hollow form. Wood is intrinsically varied in colour, texture and strength something that has to be carefully considered when creating thin walled pieces. Whilst the lathe is essential in the initial shaping of a piece, far more time is spent applying texture or piercing. A single piece can take up to 4 weeks to make.